The origin of the holiday’s name is ancient and derives from the name of Spring Goddess, Eostre. Moreover, “Eostermonat” was a name of April, when the holiday was usually celebrated. However, prior to Eostre became Easter, it was also called Pasch, which meant Passover. This name has become a prototype of modern name of Easter for many non-English speaking countries. Primarily, people were forbidden to eat eggs during Lent. Consequently, when the Lent was over, the eggs were given to servants and children as a gift. 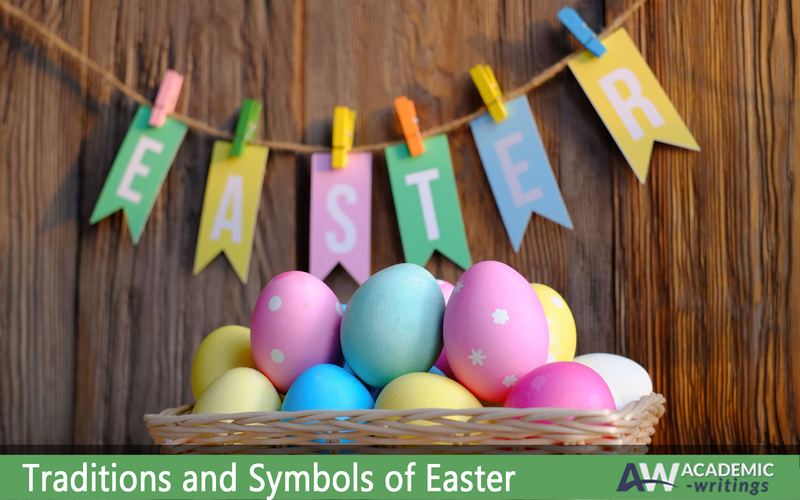 At the same time, the eggs were considered a symbol of fertility, which explained their popularity. Nowadays, eggs are also widely used in the process of preparation for Easter celebration. They are often painted in different colors and decorated. Moreover, egg hunts became very popular in many countries, where parents hide chocolate eggs from their children so they could look for them and finally get a tasty reward. The culture of painting eggs was and still remains different in many countries. For example, in Greece and Middle East people used to paint the eggs red. This color symbolized the blood of Jesus. In Armenia, people painted the image of Christ or the Virgin Mary on eggs as a reminder of Son of God and His mother. With time, Eastern Europe became a center of authentic eggs painting traditions. This culture was especially widely applied in Ukraine and Poland, where the eggs were painted applying wax. The process included dying of eggs, applying wax on some parts of them to preserve the color and then repeated dying in another color. As a result, the eggs became multi-colored and received a special look. Traditionally, rabbits and hares were considered to be symbols of fertility. The idea to include a hare to Easter celebration originates from Germany. The parent told their children that it was a hare that brought sweets and gifts for them on Easter. Later, the immigrants from Europe, and particularly Germany, to America brought this tradition with them and made it popular. There was also a tradition to bake cakes in the form of rabbits as well as make chocolate eggs and bunnies. Sending cards is a widespread tradition, which helps spread the joy of the holiday and share it with the ones you love. People in many countries send Easter cards, while in America it is one of four most popular holidays for sending such cards. In ancient times, Christians used to wear white robes as a symbol of their baptism and indication of a new life they have started accepting Christ. Later, in Medieval Europe, people organized small parades after the Easter Mess lead by the crucifix. Nowadays, people in many countries organize walks to praise Crist and share Easter joy.